Now I would like to share some of my personal experience, summarizing in a few paragraphs my achievements as the composer (hope it may serve as an inspiration for some of you). 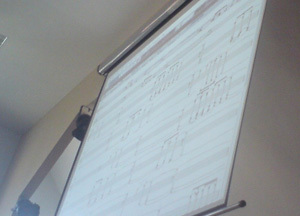 In May I had the pleasure of giving a presentation on music making and on sound to the Lithuanian students. I started by playing live some of the music from a Modern Warfare 2 trailer. Then I showed the notation for the winds section of my own piece “Dust of War”. Having finished the piece, I was astounded to get an applause from the audience. It was quite a surprise. Well, I was so tired that I seriously considered the possibility that it was merely a hallucination. Apart from that, I did not really expect the piece I presented to be inspiring for people of my generation. 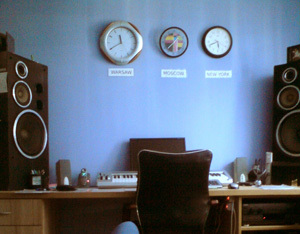 Then I created a 30-second tune from scratch in about 5 minutes, explaining all the time what instruments I was playing. I got another round of applause when I saved the music as an mp3 file and replayed it. I also answered some questions, for example about how long I had been composing, or if I had had any formal training (I said I had had not, which got me another round of applause). I finished with an animation by Aleksander Wasilewski with my music (which was received with laughter rather than fear). My Polish connection came during a business trip to Wroclaw (I was negotiating with an investor about an MMORPG), which I used as an occasion to meet my fellow composer Piotr Szwach. 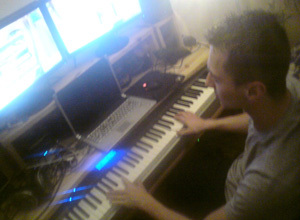 We spent time until 5 am composing war game music, discussing about equipment, music, computers and exchanging experience. I think both of us learned something new. If you ever get an e-mail asking you to make a sample of music for an “AAA” game teaser, enjoy the very fact that you were contacted (even if they have to postpone publishing the teaser trailer for technical reasons), because a lot of musicians dream of cooperating with big companies that work on large-scale projects. At the beginning, I’ve treated my adventure with music as a hobby, something like Sunday fishing at my favourite lake. After some time of distributing my tracks to friends, I’ve noticed that they like my work, what’s more – one of them persuaded me to create my own album (to my own surprise it got high rates and good reviews). The initial problem with creating music was: Who will listen to it? And at some point you realise that someone is actually listening to your music – and what is even more – he is willing to pay for it! Take advantage of every day to learn something new. After finishing work recall your music. If you can do it and you remember it – congratulations! It’s one of major keys to success in video game music creation. However, before you decide that your work is hundred percent finished and ready, listen to it a few more times. If you don’t have any objections after that, you can send it to your publisher or boss. Usually, the next day after recording you can hear your shortcomings – it’s a normal sign of creativity, all it means that you strive for perfection! 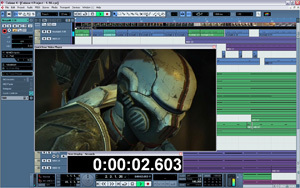 If your employer expects you to do a music track, and in the conversation, or an e-mail, he uses an acronym of ASAP (as soon as possible, in case you did not know), then focus on the recording (even if the mess in your kitchen resembles that from the movie “7” and there is a family meeting tomorrow). By sending even a sample of the tune (1 minute) you will calm the nerves of your boss, who wants nothing more than to yell “Jetson, you`re Fired!”. It is a good idea to appear on expos, conferences and meetings related to Game Development and presenting yourself, spreading your business card or demo CDs (in my case, several free singles from my Wasteland Theme album increased the interest in me). Therefore you should stay in touch with your old team, employers and companies, because someday you may receive a call / an e-mail with a job offer. In game development, as a rule, clients are working with people they remember, and with whom they had no problems during the cooperation (the more contacts you establish, the greater chances of employment you have). It’s highly probable that some past occupation will result in a contract for another game in the future. Even if you had submitted an application, and you didn’t get a job because they took someone else, it does not mean that they will not call you again in a few months, because they remembered you and your savoir-vivre). Be open to constructive criticism (and be critical of yourself). Never be afraid to alter or add some instruments to your track, even if you’ve been working on it for three days. Learn something new every day. Experiment with instruments. Creating the “Little Boy” track, related to the 6th of August 1945 (nuclear attack on Hiroshima), I was wondering how to capture the character of that event using only orchestra. When I was choosing suitable instruments, Bass Wagner’s Drum caught my attention (I used the sound of scraping and light, long beats for the sound of the shockwave). There is another thing that I discovered creating the WWII music. French horns played long, depending on the velocity, can imitate an Air Raid Siren Sound. 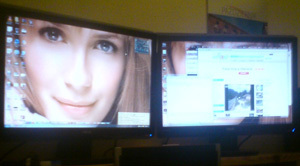 A few months ago I racked my brains on how James Hannigan created the electronic background effect in “Yoriko Theme”. After an hour of experimenting with effects and rhythm of the instrument called shaker, I finally found out how to record something closely resembling the original song. Not only did I find a good way to create background music, but also discovered how to make the sounds of futuristic computers. For about five years I have been devoting myself to an ongoing effort of boosting my keyboard skills, expanding my knowledge of orchestra articulation, and continuously developing information technology. After so many years of working with music, I finally became a recognizable person in the game industry (but before I achieved my present status, I had gathered experience in amateur projects). Professionals from all around the world write to me and invite me to music expos. 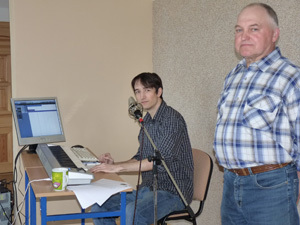 One very motivating thing for me was the positive opinion about my music, which came from a western musician who creates music for commercials and AAA games. As I already mentioned, I once had the chance to create the music for a teaser trailer of an AAA game. Then, after a few months, I got one more such offer – for the E3 expo too! By the end of May, I was to create the soundtrack for a teaser trailer for Afterfall Insanity, which meant I had to meet the team in a studio to discuss the music. E3 – this acronym left me sleepless for days. Even though I did not make it in time for the presentation (someone else had to fill in for me), I created a few versions of the music for the teaser trailer, which served as my demo reel. It is also a very pleasant feeling to receive good reviews of your work from the project manager. I was pleasantly surprised to hear from the head of the Russian game project PostWorld that after their last meeting they decided that they had to have my music at any cost. For an unbelievable moment I felt like I was the new Hans Zimmer. When strangers ask me what I do for living, I proudly answer: “I create music for computer games” (so far I have not discovered why there is always a slight expression of surprise on their faces). When I play games I sometimes add my own music in my head. Some ideas I write down as notes, for the future use. A few years ago I was supposed to create music for a Space Opera comic. Unfortunately, the piece, which I thought was perfect for it, was rejected. 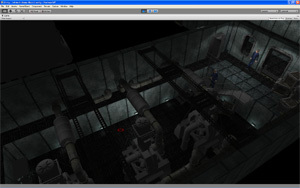 However, a few years later it found its place in another project. Finally, a few pieces of advice from me: listen to music as much as you can. After some time you will start recognizing instruments and be able to place them on the world map. As for the most important advice, which served me well in the music design (changed the way I work) and life in general – spend money to develop, not to impress (Michael Dell). After a few years of work I try to overcome my own limitations. For example, I created a 13-minute piece (inspired by Modern Warfare 2) for my second Wasteland Theme album. Remember to sign up on portals like Linkedin, Myspace, Reverbnation and to create your own homepage and keep it up to date. In the future, in order to protect your music copyrights, you should register a copyright for your tracks in organizations such as PRS (Europe) or similar. Remember to create your web page portfolio and keep it updated. I hope that my tips will be helpful, and we will meet at the Video Games Live concert this year. You may also want to read part 1 of this article.